If you use Emoji characters often in Mac OS X, you’ll enjoy knowing there is a very fast keystroke to immediately access a special Mac Emoji character panel from anywhere text entry is possible in Mac OS. Additionally, you can navigate within this quick Emoji panel entirely with the keyboard, which makes typing Emoji on the Mac quite a bit faster than using the traditional Emoji character access panel. Yes it’s that fast and that easy to type Emoji on the Mac now! The Emoji-only character panel is basically a condensed version of the larger Special Characters panel, and limited exclusively to the Emoji icon set. Once the Emoji character panel is shown on screen, you can use the arrow keys to navigate around in the Emoji icon set, then hit the Return key to place the selected Emoji character into the document, text box, message, or where ever else you are typing on the Mac. That means you can access, type, and place Emoji, without your hands ever leaving the keyboard. You’ll also find a simple Emoji search option in this Emoji panel, so you quickly search for emoji icons by name or characters by description or meaning, and access them that way as well. Much like the traditional Emoji panel, you can click-and-hold on many icons to access the different skin tones. To be clear, the Emoji characters shown here are the same, this is basically just a quicker keyboard shortcut method to access the Emoji character set than turning to the traditional method from the Edit menu, which will expand into a full sized Special Characters menu with Emoji icons alongside all other special characters available to Mac OS X. The quick Emoji panel and accompanying keyboard shortcut requires a modern version of MacOS or Mac OS X, versioned at 10.10 or later. Prior releases of Mac OS X support Emoji, but not in the same quick access panel or with the same keystroke. 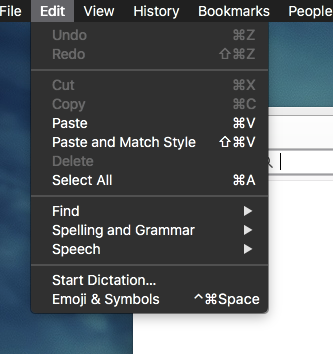 On older Macs you can use command+shift+T for the special character panel and then choose Emoji, not at all the same, but there is at least still a shortcut for all versions of OS X with Emoji support. I was interested to read that …. 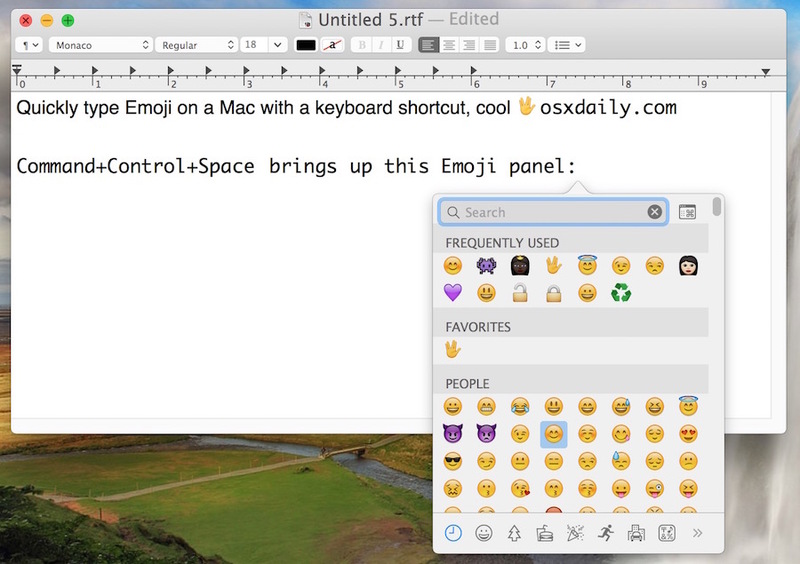 If you use Emoji characters often in OS X, you’ll enjoy knowing there is a very fast keystroke to immediately access a special Mac Emoji character panel from anywhere text entry is possible in OS X. … except Microsoft Office, which pretty much comprises the applications I use all day. Are Word and Outlook not places where “text entry is possible in OS X”? The new Office for Mac beta supports the Emoji panel, the old versions do not. MS beats to their own drum, or marches to their own beat, or whatever you call it, LOL. Anyway, Mac has the Emoji, you can put it into your clipboard, then paste it into Office in older versions if need be. Or access the special character panel from Office on Mac, you can do that too. Not for me. “Command+Ctrl+Space” brings up the larger special characters panel. Tap the icon top-right of the characters panel to switch to the emoji panel (and vice versa). Thanks Storm, that worked for me. Searched for month how to do that. Thanks a lot!!!! Doesn’t work for me on OS X 10.10.3. This command line brings up the Spotlight Search Bar ! Command + Control + Spacebar invokes a compact window (like shown in this article) but it only has my “recently used” emoji — instead of the more useful panel with “recently used” at the top and a scrolling emoji library below. Top right corner of the emoji window/box. It’s a small icon that looks like a window with a ⌘ inside. Click it. It toggles between small/Emoji and larger window/advanced. I’m running OS X 10.10.3. Command + Control + Space opens the full-sized Character Viewer. As a side issue, why can’t I switch between the CV and a window in (say) Safari? If I have to type a$b$c, where $ are special Unicode characters, I have to double-click on the characters in the CV (which gives me something like abc$$), close CV, then go back to Safari, and copy-and-paste the Unicode characters into the correct places. Can’t Safari and other apps offer a smaller CV? I think Open Office does it that way. Click the little icon in the corner of the full sized character viewer to enable the Emoji shortcut panel. The emoji panel should follow your mouse cursor, so if your cursor is in the “To” line it would appear there, “Subject” would appear there, and if the cursor is in the “Body” section, it should appear there. Try tabbing or clicking into the Body section, or type a word or two in the Body section, then use the Emoji shortcut to type the Emoji in the email Body from Chrome Gmail. I use Gmail and Chrome too, so I can confirm it works just fine. Thanks and it is quite odd. I did as you suggested both in Chrome gmail and in Safari. 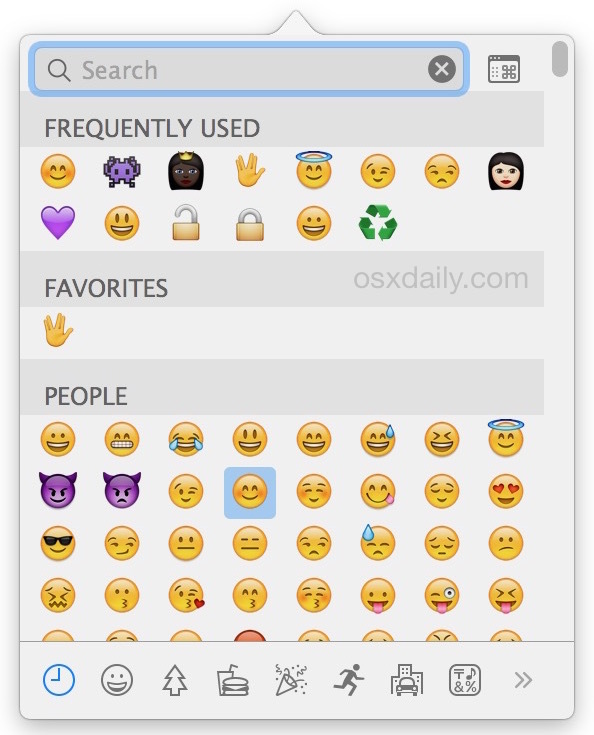 Open “System Preferences” – “Keyboard” – “Shortcuts”, and add (+) the global name for the Emoji panel, exactly same spelling and casing as in the first picture. Add your preferred shortcut. This will work as long as the shortcut is not conflicting with any other shortcuts in the current app you are using. It does bring up the emoji panel, but the cursor is still in the app (for example Messages) before I hit this key combo, so the arrow keys or search doesn’t work. I need to use the mouse to move the window focus to the emoji panel, which is very inconvenient. Is there a keyboard shortcut to change the focus? Works on 10.9.5 too! Thanks! Is there a way or shortcut to just type :) then the emoji would appear on TextEdit. It’s a waste of time to press something than just type :) for the emoji. I could not find much tutorial on this. Sorry but I think it is a waste of time to press too many buttons for a smiley to appear on my time TextEdit. Your help is much appreciated. Thanks. You are a lifesaver, thanks for the help. Now i can send many more emojis with the help of you. Thank you.